The staff at NYS are a talented and educated group of individuals. ​Each teacher brings their own unique style and technique to every class......so you may want to try them all! Rachael owns and directs, Nanaquaket Yoga Studio situated in the heart of Tiverton, Rhode Island. She began her yoga practice in 2011 through a running injury and quickly learned that yoga has tremendous health benefits, from strength and muscular endurance to clarity of the mind and mental equanimity. Rachael’s passion is alignment, not only in the asana practice but also in mind and spirit. Teaching all levels of practitioners, she shares the importance of alignment both on and off the mat. Rachael loves to share inspirational quotes, “planting seeds” her favorite, “It all begins and ends in the mind. What you give power to, has power over you.” -Unknown She has tremendous passion in sharing her knowledge of the Chakra system, subtle energy, as well as creating awareness of the types of energies, doshas, we are born with. Carefully and gently weaving this knowledge into her weekly classes, Align and Flow. Rachael is a Wanderluster at heart, with a strong desire to travel and explore, she has led both local and international yoga retreats. Discovering new places with like minds, strangers who then become family, Rachael holds a heart of gratitude for these life changing experiences. Rachael received her formal training from Patti Doyle and Liz Lynn of Innerlight and Thames Street Yoga and is a registered teacher through Yoga Alliance. 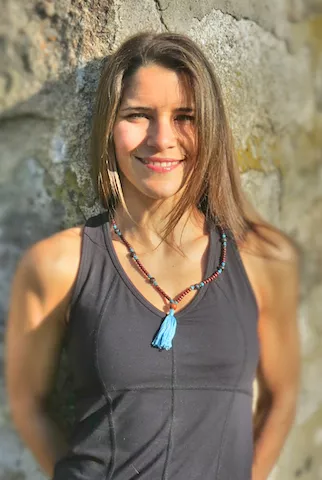 She has since expanded her study and experience with many local and international teachers attending Yoga Journal Conferences, Wanderlust Festivals, on-line training courses. Rachael is a devoted student and teacher and has dedicated her life to learn from the great gurus as well as her students, who are always teaching her how beautiful this sweet life is. As fall turns to winter, it’s time to focus on nourishing our bodies and minds. As we prepare for winter hibernation, and for the cool, crisp and dry weather Rachael's class focus will be on turning up our inner dialog as we look deeper within ourselves... connecting with stillness, grounding down and exploring uncharted areas. Though the qualities of energy, matter and consciousness, we’ll discover ways to increase or decrease these life qualities as tools to create homeostasis or balance within our daily lives. Together, we will explore ways to build stamina through breath (pranayama) and poses (asana) that offer a sense of groundedness and evenness; yet provide us with a sense of perseverance, focus and strength. As always, we will laugh together as well as connect and explore with our own personal practice in a space that is safe, peaceful and filled with amazing energy of like-minded souls. I am truly delighted and honored to be your teacher/guide on your journey of personal growth. Rachael places a lot of energy into providing you with a variety of playlists and her music doesn't overtake the class. Abbe leads a heart-centered practice on and off the mat. She is grateful to work as manager for Peckham's Greenhouse, surrounded by nature and motivated by growth. Drawing on her love for the natural world, Abbe's classes inspire strength, personal growth, and presence. Be ready for a class that will challenge you in the best possible ways as her energy pulls you in and encourages your own expression without judgment. Abbe graduated from the Thames Street Yoga 200 Hour Vinyasa Teacher Training and is registered with the yoga Alliance. ​The Art of Aspiration: Cultivating an Advanced Yoga Practice through Gateway Poses. ​Nicole first discovered yoga in 2012 as another means of exercise. In time, it became a lifestyle change and spiritual awakening. In April 2015, Nicole finished her 200 hour YTT at Thames Street Yoga. With her soothing voice and positive presence, Nicole strives to share the many benefits of yoga with her students. She holds space while maintaining an informality in her teaching that makes the practice approachable and welcoming. Her energetic flow is suitable for all levels and focuses on mindfulness, breath, alignment and playfulness. ​Brenda has been practicing yoga since 1998. She became a certified yoga instructor in 2003 and is a registered E-RYT 200 with Yoga Alliance. She has also completed Yoga Tools in 2007 enabling her to bring the benefits of yoga to her middle school classroom. She continues to actively cultivate and expand her personal practice and knowledge of yoga with many local and national teachers. Brenda's classes inspire students to discover their inner dance through a deep meditative flow, and manifest a calmer, happier more peaceful self. She offers students creative opportunities to adapt, and playfully explore many layers of yoga poses to deepen the experience of their practice. Her style is a breath based vinyasa flow with attention to fluidity, alignment, strength, flexibility, and balance. Brenda's Vinyasa Level I classes this fall we'll journey using a steady breath, holding postures, and smooth mindful transitions to empower and deepen your yoga experience. All levels are welcome as many modifications will be offered. A life-long dancer and gymnast, Kim turned to yoga to rebuild her mind and spirit after a serious illness. Yoga continues to bring balance to her life as she juggles multiple passions in service to others, including dog training, career mentoring, and healing practices. She completed her 200-hour certification with Ragunuth Cappo, founder of Supersoul yoga. Kim’s classes will focus on the connection between mind and body as well as the concept of practicing yoga on and off the mat. Her objective is to help others realize their authentic selves and full potential while comfortably expressing themselves, both physically and spiritually. You can expect creative and playful sequences in her classes that will also include hands-on assists. She recognizes and embraces the inherent light and diverse beauty in everyone. Kim also has her Level II Reiki certification and is honored to share this healing practice with humans and animals. She is grateful to have found a strong community of like-minded yogis and to part of the Nanaquaket Yoga kula. This Fall/Winter season Kim will focus on integrating the Yamas and Niyamas. The yamas and niyamas are yoga's ethical guidelines laid out in the first two limbs of Patanjali's eightfold path. ... Simply put, the yamas are things not to do, or restraints, while the niyamas are things to do, or observances. Together, they form a moral code of conduct. ​Michelle practiced yoga on and off for many years before she truly fell in love with it. The realization that others may also have mixed feelings about yoga encouraged her to become a teacher. Her intention is for her students to enjoy the physical aspects of yoga so that they can fully benefit from the emotional and spiritual components as well. Michelle’s classes focus on proper alignment, modification of poses for various ability levels, and breath work. Certified by The Yoga of Energy Flow Teacher Training Program. Registered with Yoga Alliance, RYT 200. Michelle is also certified in “Yoga 4 Classrooms” which she practices everyday with her first grade students. Michelle’s Align & Flow classes for the fall will focus on stretching and strengthening the back body. the final resting pose, Michelle will help you relax using the beautiful and therapeutic vibrations of the Gong. Sandy has been teaching yoga throughout New England for about six years and I’m so grateful to call NYS my home. Our lives are very hectic and full, which can be wonderful and yet overwhelming at the same time. It therefore becomes so important to take a “counter pose” to this potential over-stimulation in order to stay balanced and healthy. ​In my classes, I encourage feelings of playful curiosity in an environment of safety and non-judgement. ​As a yoga teacher and nurse, my yoga classes focus on deeply stretching and strengthening the body, relieving stress and deep relaxation. You will experience a slow paced asana sequence with a full range of poses, easy to learn breath practices, and varying forms of meditation. Your body, mind and spirit will be nourished with this practice. All levels welcome! I will promote loving kindness and acceptance of self and others, and cultivating a sense of peace with ourselves and the world around us. I will teach this mantra and use it to close my classes. Decided to start her journey of becoming a yoga instructor after realizing how much the practice had transformed her life and she wanted the opportunity to share this gift with others. As a Clinical Scientist Kim fell in love with every aspect of how the physical body functions. Adding yoga to her life provided a balance of physical body science and the connection to mind and spirit and how much all three aspects collectively have on healing. Medicine in itself is ever changing but researching the science of adding a love and kindness modality to your daily life shows incredible advances, in comparison to medicine alone. Kim hopes to be able to share her love, light, and life experiences with everyone through her classes. I hope students are able to leave my classes feeling restored, inspired, and connected. Kim is eager to continue adding to her education of healing modalities in the future; recently completing her certification in Thai massage. Kim is to complete her 200 hour yoga teacher training in December 2018 at Innerlight Yoga s\Studio. Tanya discovered Pilates in 2001 and became a certified teacher in 2008 from Power Pilates in New York. Her mission is to motivate her students to improve wellness as well as fitness by connecting with their breath, mind and body. Tanya's positive energy will keep you motivated and moving. Explore a class and you will find her enthusiasm for Pilates hard to resist!